Corporate Learning – companies’ professional development – a recently risen trend. All around the globe, businesses are investing large sums in educating their employees. Bigger companies even start their own training programs. But why? What makes corporate learning a valuable asset in times of digitalization? Putting your business at the forefront requires employees who are experts in their field and keep up to date. Without continuous professional development, this will not be accomplished. Employees’ job performance is essentially linked with meeting challenges of increased quality standards as well as changing processes and contents. Corporate learning reveals additional, less obvious advantages: Investing in professional development is a sign of employers’ appreciation for their employees. Consequently, this leads to greater satisfaction and increased loyalty towards the company. A continuous offer of further education indicates that the company emphasizes space for development and growth. Professional development commissioners increasingly explore the tremendous potential new media and technologies offer. Digital knowledge transfer for e-learning replaces traditional attendance seminars. Therefore companies are investing large budgets in digital learning formats, social media and mobile devices. Traditional learning environments, for instance, the physical conference room are becoming less important. Studies have indicated that learners’ attention span in the traditional setting is only 40%. Students remember about 70% of what was taught during the first ten minutes of a lecture and 20% of the last ten minutes. In the long run, digital learning resources, therefore, prove to be more effective. However, the role of a supporting teacher should not be entirely replaced. In many cases, it is the combination of traditional teaching with digital technologies that results in most successful learning. Digitalization reveals great potential in optimizing companies’ professional development. In non-work areas, digital media and tools have long manifested their position leading to a smooth adoption by employees. In an increasingly interconnected and digitalized world, technology-based transfer of knowledge becomes an integral part. Professional development does not imply a single style but invites a variety of teaching and learning methods. Combining the different styles leads to enhanced study results. Examples of supporting e-learning methods include MOOCs (Massive Open Online Courses), SPOCs (Small Private Online Courses), video tutorials, explainer videos, Egames, E-coaching, virtual classrooms, and online simulations. Flexibility is a key advantage when using e-Learning in the corporate context. Trainees have access to teaching materials regardless of time and location. Tailoring learning resources towards needs and wishes of the variety of employee groups are hence facilitated for internal development leaders. This includes specific content alongside formats. The era of digitalization instantaneously resembles the era of videos, and more precisely e-learning videos. An average student attains information up to 80% through visual perception. 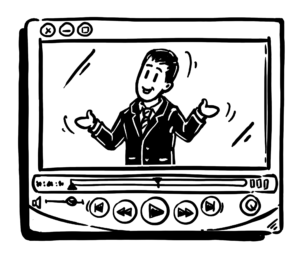 Combining video and audio contents has become one of the most effective teaching methods. Video supported learning or interactive learning is likewise gaining popularity. Subsequently, training videos show potential within online training as well as within traditional training seminars, mixed forms of education and to increase job performance. Clearly, companies are in a unique position to support their employees in their professional development as they provide continuous incentives and opportunities through digital technology. It all comes down to the right approach that can make corporate learning a valuable resource to help stand out from the competition. Technology supported teaching and learning modes are on the verge and innovative companies increasingly link these with corporate learning. Do you want to use e-learning videos and optimize your corporate learning? Our aim is to provide you with the necessary tools to create successful video supported learning resources – perfectly coordinated to your topic and target group! Let our experts to advise you!